I think I have come to the conclusion that any recommendation by Andrea Phillips is going to be something I like. This conclusion is wildly drawn from exactly two datapoints, but I stand by it for now. Several months back, she mentioned Escape Pod, a podcast of science fiction short stories, and I have been listening ever since. 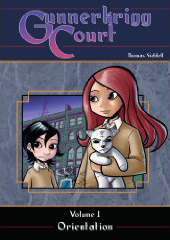 On this most recent ARG Netcast, Gupfee recommended a webcomic-slash-book that Andrea had previously recommended to her. So on Friday, Kim and I wandered over to Powell’s on Hawthorne and I snatched up their last copy of the book. I picked at it a little on Saturday, but really dug into it today on the sun porch with a snuggly cat on my lap. I then proceeded to read the online version from where the book leaves off. Good stuff. P.S. To add to the discussion on the netcast, I knew that Andrea’s site, Deus Ex Machinatio, was not “Deus Ex Machina”, but I guess I never looked closely at that last word. I always figured it to be a coffee-based pun.